1. On the news-front, the Henderson County Tourist Commission is happy to hear about two new eatieries moving to downtown this year. “The two — Delizio Gourmet Italian Eatery in the Soaper building at Second and Main as well as Commonwealth Kitchen and Bar a few doors away in the former Amici’s building at 108 Second St. — are scheduled to open in December and January, respectively.” Read the full Gleaner article here. 2. Christmas Open Houses in downtown and at Audubon State Park are coming up soon, giving shoppers in Henderson even more reason to shop local this year. Visit downtown on November 9-10 and the John James Audubon State Park Gift Shop on November 17 for special deals, new merchandise and more. 3. Local shop gabbi’s Boutique has all the necessary items to keep your feathered friends fed this winter. Keep birds in your back yard with gabbi’s collection of birdhouse and bird food. The shop is located at 137 2nd Street. 4. The Christmas Parade is coming up – and looking for participants! The parade will be held at 10 a.m. on Saturday, December 1st. To get involved visit the Downtown Henderson Partnership website. 5. Want to burn a some calories for a good cause this Thanksgiving? Think about participating in the annual Turkey Trot. Hosted by The Presbyterian Church, the event chooses an area benefactor and donates the money from the 5K to the charity. Race starts at 9 a.m., with registration starting at 8 p.m.
6. The holidays always mean great performances at the Henderson Fine Arts Center! This year catch the Children’s Nutcracker or Miracle on 34th Street. While at the center be sure to check out the galleries. The Kentucky Wildlife Art Show exhibit is on display until the end of November. 7. With winter comes dry itchy skin – and you’re in luck! Right in downtown Henderson you can buy “Kentucky-Crafted” handmade body cremes and lotions at Lucia Soaps. Find a listing of a few of the products here or drop in to the shop, located at 115 First Street. Open Tuesday 12-5, Thursday and Friday 10-5 and Saturday 10-3. 8. It’s boot weather! Stop on it at Simon’s Shoes and check out their great selection of new boots. Check out some of the photos on their Facebook for more details. Simon’s is located at 100 N. Main Street and specializes in wide and narrow sizes! 9. We’ve updated our Downtown Henderson Historic Walking Tour and we hope you’ll check out the new design and listings. Although many of the houses on the route remain the same, we’ve added new information and photos about the homes. 10. Downtown coffee shop and eatery, Planter’s Coffeehouse sure knows how to bake up great seasonal food. 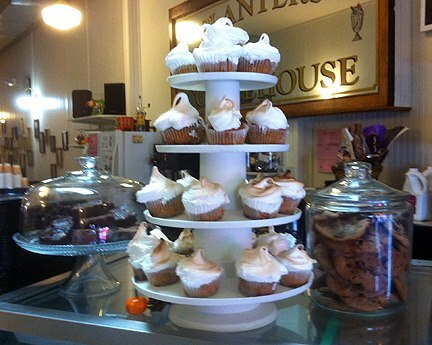 Try their S’more Cupcakes or Pumpkin Praline Cake and warm up with a cup of coffee. Specials are listed daily on their website.